The market and Christmas village Champs Elysées returns from 13 November 2015 to 3 January 2016. This year, a maximum of entertainment, rides and stalls will be waiting for you. With 30 new stalls next to the roundabout of the Champs-Elysees, you will have what to shop. For the year-end holidays, the most beautiful avenue in the world takes Christmas village-like. 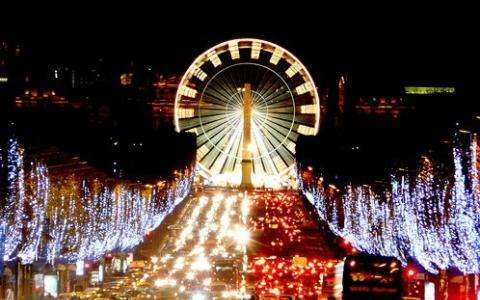 With its new contemporary ecological and illuminations, which pleases or does not please, but after people sparks debate, the Champs-Elysees will host the famous Christmas market in 2015 and its many attractions. Each year, this does not less than 15 million visitors who come to walk the aisles of this famous festive market. Rich with many free events, it is the joy of tens of thousands of children every year who flock to the meeting of the fairground and Santa on his sleigh. Held this year from November 13th 2015 to January 3, 2016, the Christmas Market Champs become even more quality. Indeed, 40 craftsmen give you appointment to unveil their creations and know-how. Also find 6 special stands run by national associations such as the Secours Populaire. Dragging along the driveway, you will find many cottages of all kinds. Between the stands of waffles, crepes and sweets, a village of fine craftsmanship with original objects is revealed. You will meet artists from all over France who will share their passion. And as more there are, the more you love, the market will expand again Champs Elysees roundabout until where 30 additional booths are planned. Also note that the Champs Christmas market is also enroll in the Plan Climat worn by Parisian Executive. Artisans and merchants will replace plastic bags for single use by ecological alternatives, they will use in the drink cups recyclable materials, while incandescent lighting will be replaced by leeds s.
From 1 to December 24, Santa Claus will be waiting for you to speak to the children in his sleigh, perched 20 m from the ground and pulled by his reindeer. A spectacular free attraction that wins all the votes every night.